Debris free is the goal in Miami. On September 2nd, 2018 the Miami Hurricanes played Louisiana State University for their home opener. This time something was different about their jerseys. The team wore uniforms made of recycled marine plastic waste. In collaboration with Adidas the Hurricanes will now rep their environmentally friendly uniforms. By having this nationally recognized football team wearing special uniforms like this the hurricanes hope to bring spotlight to the problem of plastic waste in the ocean. These adidas alternate jerseys made of recycled materials are the first of their kind. This may set a trend for future sports manufacturers to use these materials in their products. A trend of mass producing things on a large scale like jerseys all of recycled material could have a tremendous impact on pollution in the world. If more big companies like Adidas did something to give back to reduce pollution this could also make a large impact on the environment. According to theguardian.com 100 companies make up 71% of global emissions. Organizations like Debris Free Oceans hold different types of cleanup events on and off shore to . This organization holds fun events centered around cleaning up and giving back to the community. 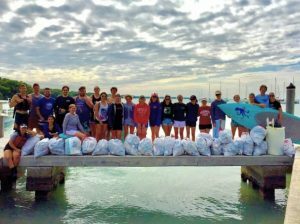 They offer yoga cleanups, “Keg and Klean’s”, and even snorkeling and scuba diving marine clean ups. Events like this bring the community together to keep everyone free from waste pollution. Debris Free Oceans even hold Zero Waste events. These are events are fun, light-hearted events to bring awareness and knowledge about plastic waste pollution. Why not fight pollution and learn how to prevent it while having fun! The organization also goes through steps with the venues they work in to assess their waste output, and how they can assure that these Zero Waste Events are truly zero waste. With all of this public spotlight and attention. We hope to continue to make steps towards a waste free ocean and a cleaner better world.